Thisstory was updated at 9:45 p.m. ET. NASA?sspace shuttle Endeavour cast off from the International Space Station lateFriday, capping more than a week of orbital construction to add a phenomenalnew lookout dome and room to the orbiting lab. Endeavourundocked just before 8 p.m. EST (0100 Saturday GMT) to begin the two-day tripback to Earth as both spacecraft flew 208 miles (334 km) above the AtlanticOcean. Theshuttle?s six-astronaut crew spent nine days at the station, where theyattached the new Tranquility module and a seven-window spaceobservation deck, which they called the ultimate ?window on the world.? ?Thanksvery much for the great hospitality. We?re sorry to go,? shuttle commanderGeorge Zamka told the station crew. ?Hope you enjoy Tranquility and the newview.? ?Godspeedguys, we?ll see you back on the planet,? station commander Jeffrey Williamsradioed back. Thestation astronauts had to keep the shutters closed on the new observationdeck?s seven windows while Endeavour departed to protect them from inadvertentdamage from the shuttle?s thrusters. Mission managers said it might be possibleto open the windows later, once Endeavour was far enough away. Thenew lookout includes a huge round portal that is 31 inches (80 cm) wide ? thelargest space window ever built. ?It?stough to turn away from that window,? Zamka said before leaving the station. Heand his crew are due to return to Earth Sunday night to end their two-weekmission with a landing at NASA?s Kennedy Space Center in Florida. Endeavourblasted off Feb. 8 carrying the space station?s new Tranquility module and thelookout dome, called the Cupola. ?You have had an absolutely awesome mission,but now it is time to say good-by station, hello Earth!? Mission Control toldthe shuttle crew today in a morning message. Tranquilityis a nearly 24-foot (7-meter) long room attached to the left side of thestation?s central Unity module. It is named after NASA?s historic Apollo 11moon base and will serve as the station?s gym, robotic arm control center andlife support system hub. MissionControl gave Endeavour?s astronauts an extra day docked at the space station sothey could finish up work to move urine and water recycling equipment intoTranquility. The robotic arm workstation will be moved later after the shuttlemission, NASA officials said. TheCupola lookout is the crown jewel of the space station. The window-lined domeis about 10 feet (3 meters) wide and 5 feet (1.5 meters) deep. Its centralround window points directly at Earth, with the six others arranged in a circlefor a phenomenal, 360-degree panoramic view. "Gettingto look out the shuttle windows and the station windows has been awesome,"Endeavour pilot Terry Virts told reporters late Thursday. "But when welooked out the Cupola, it's impossible to put into words?it took my breathaway.? Thetwo new additions took three spacewalks to install. They were built in Italyfor NASA by the European Space Agency and together cost nearly $409 million. Withthem installed on the space station, the $100 billion orbiting lab is now 98percent complete after more than 11 years of space construction. The stationalso weighs nearly 800,000 pounds (362,873 kg) and is the product ofcooperation among 16 different countries. Itnow has a dozen rooms, counting the small Cupola. Theastronauts also had time for some levity at the space station. During theirfree time, they took a cosmic phone call from President Barack Obama and heldan impromptu WinterOlympics in space. Endeavourflew a victory lap around the space station before leaving the orbiting lab?sneighborhood. 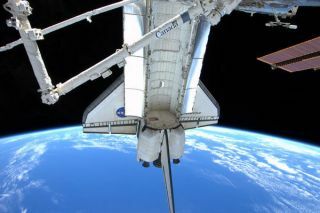 The maneuver allowed the shuttle astronauts to take a look attheir handiwork and snap photos of the space station. ?Youguys are looking absolutely marvelous down there with the backdrop of the oceanand the clouds,? Williams said he watched Endeavour below the station. Virts wasat Endeavour?s controls during the maneuver. MissionControl asked the spaceflyers to take pictures of a Russian Soyuz spacecraftalso docked at the space station. Part of an insulation blanket on thatspaceship appeared loose or wrinkled and Russian engineers hoped for betterviews, mission managers said. Endeavourastronauts will also conduct one last inspection of their spacecraft?sfragile heat shield. The survey, a standard chore since the 2003 Columbiatragedy, will use Endeavour?s robotic arm and a 50-foot (15-meter) inspectionpole to look for any damage to the shuttle?s wings edges and nose cap whileit?s been in space. Theastronauts performed a similar scan just after launch to look for any damagecaused by fuel tank debris during liftoff, but Endeavour?s heat shield wasperfectly healthy, mission managers said. Apiece of fuel tank foam damaged the shuttle Columbia?s wing during its 2003launch, leading to its destruction and the loss of seven astronauts duringre-entry. NASAengineers will study the data and images from Endeavour?s upcoming inspectionbefore clearing the shuttle and its crew for their planned weekend landing. Endeavour?sSTS-130 mission is the first of NASA?s five final shuttle missions before thespace agency retires its three aging orbiters in the fall. Theshuttle and its crew are due to land Sunday night at 10:16 p.m. EST (0316Monday GMT).